Mr. Garrett currently provides primary and secondary music education instruction for students at West Liberty University. His duties also include supervision of music student teachers, instruction in music for classroom teachers and classes in beginning jazz improvisation. In addition, he provides support for university instrumental ensembles and offers studio instruction for trombone and baritone students. 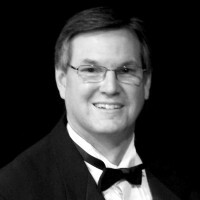 Prior to coming to WLU, Mr. Garrett served thirty years in the West Virginia public schools teaching instrumental music, general music and music theory. He was the chairman of the Visual and Performing Arts Department at Wheeling Park High School from 2007 – 2012. In the twenty seven years under Mr. Garrett’s direction, the band program at Wheeling Park High School grew to include Concert Band, Marching Band, Percussion Ensemble, Marimba Ensemble, Steel Band, Woodwind Ensembles, Brass Ensemble, Jazz Combos, and Jazz Ensemble. The Marching Band was honored with more than two hundred fifty marching music awards and was a Bands of America Eastern Regional Finalists in 1995, 96, 97 and 98. The concert organizations received numerous Superior ratings in Solo and Ensemble, Jazz Ensemble, and Concert Band Festivals. The Concert Band has received only Superior ratings at Band Festival since 1985 and was named West Virginia Honor Band in the Spring of 2000 while the Jazz Ensemble was a state champion in 2006.
honor bands including ensembles at Shepherd University, the University of Alabama, Marshall University, West Virginia University and the Maryland All-State Junior Band. He is an active guest conductor and adjudicator for concert and marching bands across the country and for Drum Corps International. He has also completed certification classes in the Microsoft Training Academy. In addition to receiving a Citation of Excellence from the National Band Association, Pat was named Teacher of the Year for Ohio County in 1991, West Virginia Band Master of the Year in 1993 and 2004, Wheeling Park High School’s Teacher of the Year for 1995-96 and was named to the WVMEA Hall of Fame in 2009. Join our Facebook group, Music at West Liberty University.